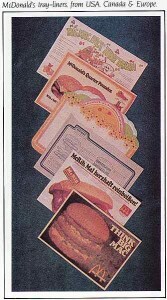 The fast food collectibles article in Collectors’ Showcase Magazine reproduced below first appeared in Keith Kaonis publication in 1984,in San Diego, California. The original publication of this article appeared on pages 36-39, in the issue of March/April 1984, Volume 3, Number 4. All photographs were taken by Karen Atkinson. All items photographed are from the collection of Gloria Nash. Collectors’ Showcase Magazine, was a premier state of the art periodical showcasing a wide range of fine antiques and to my knowledge, is regrettably no longer in print. Click here to see a rare copy of this issue in our store. A cartoon designed created by Gary Trudeau comments on the modern quick-service restaurant industry, from the diner and the hot dog stand to the fast food and family restaurants found today. The cartoon shows the first English words spoken by a Vietnamese refugee consisting of a tongue-twisting hamburger advertising jingle about “two all-beef patties.” The restaurant industry has significantly impacted society as we know it today. There are fewer boundaries of class, culture, race, and age to differentiate a McDonald’s in a tiny American farm town from a McDonald’s on a busy urban street in Japan. A by-product of the chain restaurant industry has been the many items manufactured over the years intended to display the minimalist, colorful logos representing each business in the industry. Many of these fast food collectibles include dolls, displays, watches, glasses, toys, employee uniforms, premiums, and paper ephemera. From simple beginnings one hundred years ago, this segment of the hospitality industry has grown and matured into one of the most dominant industries in the world. Over the years each chain has included something of its own personality to aid in the growth of fast food restaurants such as McDonalds, Burger King, White Castle, Nathan’s, Kentucky Fried Chicken and Pizza Hut. Today, competition has compelled these businesses to spend enormous sums of money for advertising. This is the primary factor that controls the restaurants that will survive. 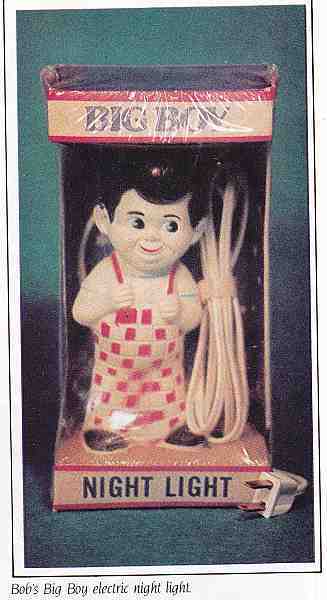 Chains that had difficulty keeping up with the times, included Bradford House, Burger Chef, and Wetson’s. They eventually closed or diminished in both size and stature. Today, only a handful of chains remain to compete in this ever-changing industry. Industry growth has altered how each surviving corporation has chosen to define their images to the public. Whether by way of a jingle in a television commercial, a character doll, a toy license, or a slogan, for example, these images and sounds have established themselves in modern cultures around the world as well as a part of our everyday habits. 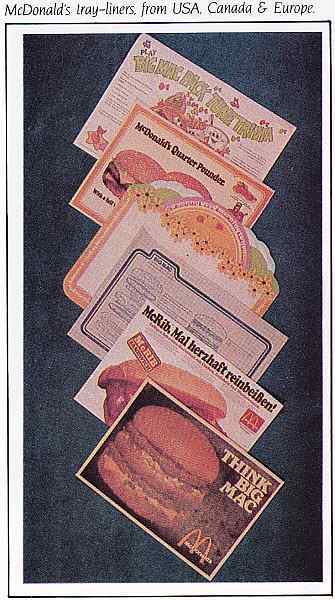 In the early days, however, advertising campaigns by chain restaurants were geared at the large “baby boomer” population. 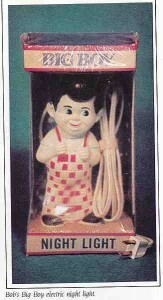 Today, many baby boomers reflect nostalgically on their childhoods to remember the neighborhood restaurant where they received a free toy after purchasing a hamburger and a shake. They fondly recall their eighth birthday party complete with hats, cake, and a magician, that was held at the corner hamburger shop. 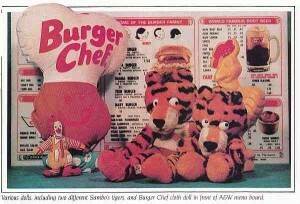 Perhaps the family attic still houses some of the fast food collectibles the children saved. As baby boomer began to grow into adulthood and travel, meeting other people with whom s/he shared these common experiences has helped our world grow a bit smaller. Some of the many items manufactured to promote these chains included board games, dolls, giveaway toys, in-store advertising, holiday promotions, glasses, trayliners, and so much more. 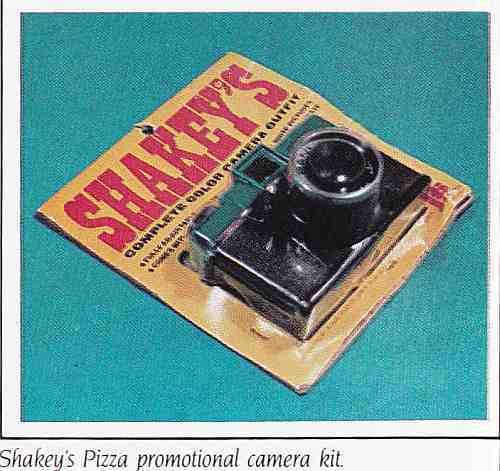 Today, these fast food collectibles are being rediscovered in attics, toy chests, warehouses, and in Collectors’ Showcase Magazine. They are easily (and inexpensively) bought at garage sales and flea markets. 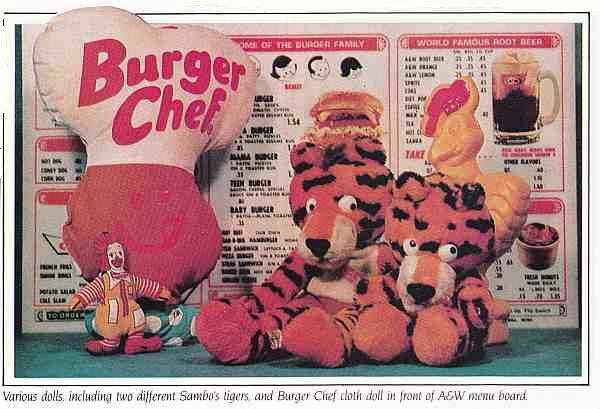 There is literally a world full of fast food collectibles that have been manufactured over the years with logos and designs that change with the times. Although both growing demand and time have increased the value of many of these items, collecting these artifacts are still within the reach of the curious and determined collector. A collection that specializes on a specific theme will prove an exceptional way to catalog or describe this slice of history during the twentieth century. The passionate fast food collector who is determined to “find it all” (and then some) enables this hobby to thrive. 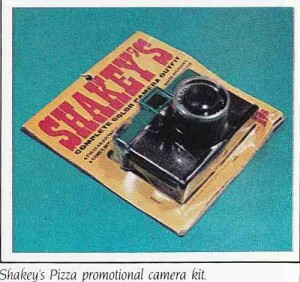 When Collectors’ Showcase Magazine and the auction houses make buying some types of collectibles prohibitive or when reproductions of items dissuade and frustrate the collector from continuing to amass a collection, the fun of discovering items from the chain restaurants can be a fulfilling endeavor. With one hundred years of chain food restaurants to catch up with and catalogue, let us continue the search to find that ultimate possession of a McDonald’s sign depicting Speedee or an original Jack-in-the-Box limited edition manager’s watch, in mint condition, of course. Do you remember the 1970’s television commercial with the McDonald’s jingle, “Don’t Forget to Feed the Wastebasket”? In the early 1970’s, circa between 1972 and 1975, McDonald’s produced three different promotional wastebasket coin banks to encourage children to learn to two important life skills— to clean up after themselves as well as to save money. 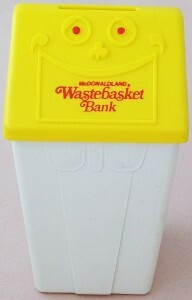 One of the three coin banks was unmarked, while another coin bank was imprinted with “Ronald McDonald.” The third promotional wastebasket was made in 1975 and had “McDonaldLand” imprinted on it, as you can see here on the vintage bank from our store. In the ad, we see Ronald M., Mayor McCheese and two children eating outside at a McDonald’s restaurant on the patio. Suddenly, two animated coin bank wastebaskets begin to sing to the children. Would you mind letting us have the paper please when you’re through? It’s a special little treat when we get to eat the paper–yes indeed! Don’t forget to feed the wastebaskets, ‘cause they’re hungry, too!